Hal Carter, Billy's friend and former tour manager, died in hospital on July 13, 2004 after a long illness. It was his 69th birthday. Hal (whose real name was Harold Carter Burrows) was hired by Larry Parnes in 1959 and became Billy's personal manager, until leaving to work with artists in the USA for several months in 1960. He returned and was reunited with Billy in late 1960, and was heavily involved in the Play It Cool project. Hal quit Parnes' organisation in 1963. He continued to support Billy until Billy's retirement in the late 1970s. He was involved in Billy's comeback in the 1980s, and was heavily committed to The One And Only album. Hal remained a close friend of Billy's partner, Lisa. In later years, he ran one of the country's most respected music agencies, the Hal Carter Organisation. Before Fury Fest 03, he told me how much he hoped to be able to attend, but his health prevented him. 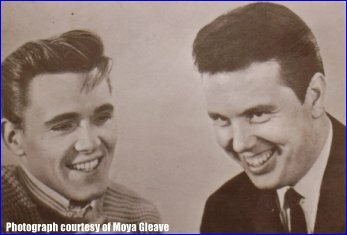 Vince Eager writes: I first met Hal in 1959 when he was driving for Larry Parnes. I saw him last, 18 months ago. He hadn't changed one bit. As Joe Brown said, "Hal still had dinner at 12 noon!" We did a one hour radio interview together a couple of years ago and it was the most entertaining hour I had spent in years. Billy, Eddie, Gene, Joe, Marty, Alvin, you name a name who had worked with Hal and they will all say. "The guvnor!" He was truly loved. A major part of our musical heritage has left us. The reaction of Alvin Stardust when I phoned him today summed it up. The silence was so loud. My feelings for Hal are far beyond the written word. "To know him was to love him." Bless him. He's no longer suffering. Chris Eley, on behalf of The Sound Of Fury, the official fan club, paid this tribute: Hal Carter mixed with the famous and rich as part of his daily occupation over the years, yet he still found the time, not only to acknowledge the fans of Billy Fury, but also to befriend them. He never lost the common touch and that, taken together with his Liverpool humour and obvious love for Billy, is mostly what endeared so many of us to him. He was prepared to stand up for what he believed was right and always supported the Sound of Fury, being very appreciative, publicly and privately, of the fact that all of the work undertaken in Billy's name was purely voluntary. As late as last year at the Lisa Voice Blue Plaque Tribute to Billy, he chose to make a point of mentioning Billy's fans for their dedication, in particular in relation to the bronze statue. He could have devoted the whole of his speech to Billy, and his association with him, but chose not to. That was the mark of the man. Unlike so many in the music business he never considered the fans to be below his station, although that didn’t stop him calling me an anorak! Those of us of The Sound of Fury, past and present, who were fortunate enough to share his company, whether at Mill Hill, his home or the intimate and very special pre-MilI Hill gatherings at the home of one of his dearest friends, are proud that he touched our lives. This is yet another man from humble Liverpool beginnings who grabbed life by the throat and carved a lifelong career in a very fickle business, actually being paid (as he once said), for doing what he wanted to do. This was after a job in the circus and a stint in the Army doing his National Service. This was the man who met Elvis and actually discussed the merits of It's Now Or Never with him; the man who rode shotgun on so many US and UK rock 'n' roll legends and who was not only the manager but a close friend of the very special Billy Fury. He learned well from the school of life, and from his long apprenticeship in the music business, putting it all to good effect by creating the existing much- respected Hal Carter Organisation. He was also someone who loved his family very much indeed and was extremely proud of them. Hal's life is a cause for celebration, not sadness, and although we are going to miss him in so many ways, perhaps we can at this terribly sad time, at least try to view things that way. To all Billy fan’s, Hal will be remembered as an integral and vital part of Billy’s life, and also, among other things, for the Fury label and Please Love Me. To those who knew him, Billy, football, Chinese meals, the veritable string of famous acts and Jack Daniels will always be synonymous with his memory (especially the football!). So long Hal, and thank you so much for taking the time to touch so many of our lives in such a positive and humorous way. Our thoughts are with Hal's family and close friends at this time. Harry writes: On behalf of this site's many visitors, a donation to Cancer Research has been made in Hal's memory. London N2, on Tuesday, July 20 at 12.30pm. Tony Harte reports that more than 200 people attended. Recordings of Billy Kingsley's You Are My Love, Billy's Halfway To Paradise and You'll Never Walk Alone by Gerry and the Pacemakers were played..
Hal Carter in 1968 established the very successful entertainment agency Hal Carter Organisation, concentrating on Sixties and Seventies music. Surprisingly for a manager and agent, he was much loved by his artists and offered guidance on every aspect of their work - choosing songs, producing records, determining promotion and, most of all, arranging tours. and that should have set off alarm bells because he was a very mean man, but it was show business. Two weeks later he asked me if I would work for him at £10 a week. I was earning £18 at Union Carbide but I said yes and went to London. 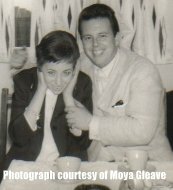 During 1959 Carter worked on the road as Marty Wilde's personal manager and then was moved to Parnes's new protégé, Billy Fury, who was also from Liverpool. Fury had a damaged heart following rheumatic fever as a child, but he took little care of himself, smoking heavily, exerting himself on stage and spending his spare time in wet fields watching wildlife. Parnes realised that UK rock'n'roll fans wanted to see the real thing and he signed Eddie Cochran (whose star was on the rise) and Gene Vincent (a Grade A troublemaker who had union problems in the United States) for an extensive tour with Carter as tour manager. Cochran, who came from California, hated the British weather, but he befriended Carter and asked him to leave Parnes and become his manager in the US. Gene Vincent used to carry a gun and a knife around with him, which he called Henry. He would say to people, "Do you want to meet Henry?" and he would pull out his knife. He had a street-gang mentality and he terrorised the tour bus one night coming back from Ipswich. He ripped the bass player's suit and five of us jumped off at the lights in Romford, even though we lived in north London. They wanted to get back to London quickly and so they didn't want to use the tour bus. A taxi driver quoted them £30 and they thought it was a bit steep. Someone borrowed his mate's car and said that he would take them. He had no insurance and he took a wrong turning just before the bridge at Chippenham. He was heading back to Bristol when the accident occurred. Carter continued to work on Larry Parnes's extravaganzas and on one occasion sacked Georgie Fame, one of the supporting acts, for defying him by playing jazz on a rock'n'roll show. In 1962 Hal Carter persuaded Oriole Records to let him make a single, "Twistin' Time is Here" and "Come On and Twist". He was listed as the sole composer for "Come On and Twist" and, when asked how he came to write the music when he did not play an instrument, he replied, "It wasn't difficult. Eddie Cochran had shown me a couple of chords." Carter himself left Parnes in 1963. Parnes was furious, refusing to sanction a record that Billy Fury had made of one of Carter's songs, "Please Love Me". He worked as the road manager for the Kinks before establishing his own company in 1968, which soon became known as the Hal Carter Organisation. He went on to manage and produce the band Liverpool Express, who had hits with "You are My Love" and "Every Man Must Have a Dream", both in 1976. He also produced a Top Ten single for Coast to Coast, "(Do) The Hucklebuck" (1981). he would tell you that he lived 15 years longer than he expected. He was always saying, "If I make 30, I'll be delighted", and that's why he drove fast cars and did everything at top whack. His life was going to be short, but it was going to be great: that was his mentality. In later years Carter acted for Marty Wilde, Eden Kane and John Leyton and also set up touring versions of well-known bands with rather suspect line-ups including the Tornados, the Equals, Middle of the Road and the New Seekers. Carter was made for tribute bands and he managed Rumours of Fleetwood Mac, T.Rextasy and his particular favourites, the Illegal Eagles. Jean Todd and I went to the Memorial Mass for Hal Carter. We arrived at the church and met Peter and Lyn Keller from the Billy Fury fan club outside, then went inside and sat with them. Hal's two sisters who had organised the mass at their local church were there along with a brother with two grown-up children. There were lots of cousins and their children along with their kiddies. The majority of the remainder of the congregation seemed to be locals from Kirkby - there were probably around 70 people there. Among those attending were Billy's mother and brother, Jean and Albie Wycherley. The service was lovely. One of Hal's cousins sang along with two other women who played guitars with a man on bass as she always does, not just for this occasion. They harmonised with all the hymns and were really brilliant. Hal's older sister gave a reading as did his niece and then his younger sister gave a eulogy about Hal, saying what a great brother he'd been. She told of him getting a bike which had no brakes from a local vicar and crashing through their shop window, his Dad getting to him in the nick of time to stop him from being cut in two by the falling glass. They thought it was divine intervention because a vicar had previously ridden on it. They are very close and family is very important to them. She stressed that Hal was not just the public figure known to many but a very dear brother to them who is much missed. By Bill Harry, archived from Merseybeat website. Hal Carter, one of Liverpool’s musical legends, died in hospital following a long illness at the age of 69 on 13 July, 2004. Hal's funeral was held at Islington Crematorium, High Road, East Finchley, London N2, on Tuesday, 20 July at 12.30pm. attended by more than 200 people, who included: Joe Brown, Marty Wilde, Vince Eager, John Leyton, Tommy Bruce, Bruce Welch of the Shadows, Jess Conrad, Danny Rivers, John McNally, Spencer James and Frank Allen of The Searchers, Dave Sampson, Chip Hawkins of the Tremeloes, Peter Sarstedt and Mike Berry. 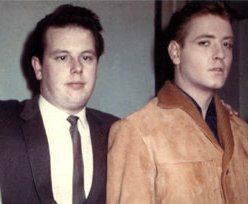 Recordings of Billy Kinsley's ‘You Are My Love’, Billy Fury's ‘Halfway To Paradise’ and ‘You'll Never Walk Alone’ by Gerry and the Pacemakers were played. 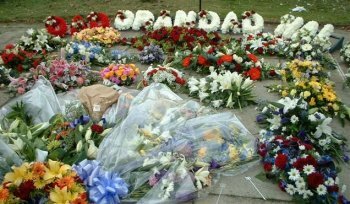 A Memorial Mass was also held in his honour at St Michael’s Church in Oatlands Road, Kirkby, Liverpool on 18 September 2004. It had been organized by Hal’s two sisters and among the 70 people who attended were Billy Fury’s mother Jean and his brother Albie Wycherley. 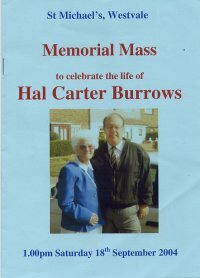 Hal was born Hal Carter Burrows in 1935 and raised in the Scotland Yard area of Liverpool. Following his National Service, he left the army in 1956 and took several jobs, at one time working at Bertram Mills Circus, at another as warehouse foreman to Union Carbide, a chemical company. He decided to spend his spare time organizing local rock ‘n’ roll shows and even began managing a group in the evenings called the Brunswick Five. He suggested the band add a girl singer to the line-up and they became the Brunswick Five Plus One. When Hal heard that there was a package show playing at the Liverpool Empire, with Marty Wilde topping the bill, he decided to go along in an effort to meet with Wee Willie Harris’ manager. He met Jimmy Tarbuck at the stage door and Jimmy offered to introduce him to impresario Larry Parnes, Wilde’s manager. The tour promoter John Smith then came to the stage door in a state of near panic saying that Marty and Parnes couldn’t get out of their hotel because of the crowds of fans. Hal turned to Smith and said he’d take care of it and managed to get Marty and Parnes out of the hotel via an alley to the rear, had them taken by taxi past the crowds of fans to the theatre foyer and into the backstage area. After the show had finished Hal gave Parnes his contact details. He then sorted out a cab to take Marty and Parnes back to the hotel, but then found they’d already left. When he arrived at the hotel he was kept waiting and then received a thank you note and ten shillings from Parnes. At the time Hal was receiving £18 a week as warehouse foreman, but he was prepared to take such a drastic drop in income because he wanted to become involved in show business. 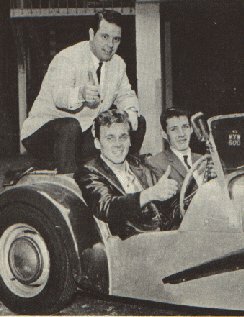 He joined Parnes team as a band boy but two weeks later was appointed tour manager for Marty Wilde, which lasted for a year until he was asked to look after Dickie Pride. Pride was a complex artist who had an unpredictable nature, but Hal managed to cope. His next task was to oversee a tour with Gene Vincent and Eddie Cochran in 1960. Cochran was so impressed with Hal that he invited him to become his manager and run his business affairs. There was a rapport between them, which was to end with Eddie’s tragic death. Hal had been called away from his duties on the tour to supervise Billy Fury and Joe Brown for their appearance on the TV show ‘Wham!’ In the meantime, following the show in Bristol, Eddie decided he wanted to return to London and, together with Sharon Sheeley and Gene Vincent, was offered a lift in someone’s car (they didn’t take the tour bus and considered the taxi fare to London to be excessive). A tyre burst on the car, which crashed, killing Eddie. Hal feels that if he were there the accident wouldn’t have happened and he would have insisted they had a good night’s sleep before traveling. Incidentally, Hal recorded for Oriole Records in 1962 with his single, "Twistin' Time Is Here" and the self-penned "Come On And Twist". Larry Page asked Hal to work with the Kinks and by 1967 he’d formed his own publishing company Moggie Music and gone into business with Stan Phillips, manager of the Troggs and Loot. He then began to manage a series of artists including the Merseys, Billy Fury, Marty Wilde and the Swinging Bluejeans. In 1971 he took over management of Shane Fenton and within a couple of years had transformed the singer’s image to fit in with the new glam rock trends, also changing Shane’s name to Alvin Stardust. As Alvin, Shane enjoyed a high profile and several chart hits although Hal had a dispute with the record company and decided to sell out his management share. He next became involved in promoting his own nationwide rock ‘n’ roll revival tours with a host of artists including Billy, Marty, Joe Brown, Heinz, Tommy Bruce and Jess Conrad. By that time he had built up a solid reputation and his Hal Carter Organization was one of the leading promoters of acts from the 60s and 70s and now included several further signings ranging from Mungo Jerry to the Equals. He returned to the charts in 1981 with another of his recordings, the group Coast To Coast with ‘(Do) The Hucklebuck’ and the following year brought Billy Fury out of retirement to become his manager. It seemed as if Billy was on the brink of record success again but, tragically, died. In recent years Hal was involved in a number of revival and tribute bands ranging from Rumours of Fleetwood Mac to the Illegal Eagles, while continuing to promote his numerous other acts. Even when he was ill he was keen to see the release of the Rockin’ Horse album ‘Yes It Is’, and still had a heart full of rock ‘n’ roll. He was a one-off and will be much missed. Billy Kinsley, had a long professional relationship with Hal through the Merseys, Rockin’ Horse and Liverpool Express, he writes: “Hal passed away very peacefully with his two lovely daughters and his brother Ray at his bedside. If anyone should have written a book it was Hal. 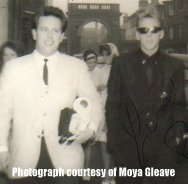 “He met Elvis, was great friends with Eddie Cochran, managed Billy Fury and many more. “I first met Hal in 1966, we (The Merseys) were on tour with The Who and Hal was the lighting guy. I heard this strange accent, half cockney, half Scouse engaged in a bloody big argument with Pete Townshend!! Pete wanted to know why Hal had this big green spotlight on his face and particularly on Pete's nose, making it look twice as big as it was. Hal said it was because Pete hadn't said how good the previous night's lights were and until someone thanked him the green light stayed. They argued for what seemed hours that night but I don't know what sort of compromise they came to as from then on they were the best of buddies. The green light was never seen again. Editor’s Notes: Hal’s own story would have been ideal for Mersey Beat. He told me some years ago that he was writing a book – and I looked forward to it, because he told me great tales of his meetings with Elvis and his association with some of the classic names in rock. At one time he even asked me to collaborate with him on a book about Billy Fury, an artist he originally became road manager for and eventually managed. He also managed a string of other artists over the decades, ranging from Marty Wilde to the Swinging Bluejeans. Over the years Virginia and I joined Hal on numerous occasions – he’d drive us down to Hastings to see the Searchers, we’d team up with him for an evening at the Hippodrome with many of his artists, drop in to the Valbonne where he’d booked the Swinging Bluejeans, enjoy a New Year’s Eve party as his guest at the Blundellsands Hotel where he’d present artists such as John Leyton and the Vernons Girls and so on. Hal asked me to act as press agent for some of his acts such Loot, Liverpool Express and, later on, Coast To Coast, for which I was awarded a silver disc. In recent years Hal approached me to act as p.r. for some of his other acts, but I’d decided to give up acting as press agent for good, but was able to advise him on who to approach. Virginia and I have known Hal for over forty years and he was regarded as a good friend, someone we enjoyed being with, a person with warmth and humour. It was devastating to hear he was ill with cancer and, in these circumstances, one hopes for some sort of recovery as not all cancers are fatal. I’d phone him in the hospital and his situation sometimes improved, sometimes worsened. When he came out of hospital he visited us and I was able to lend him my vinyl copy of ‘Yes It Is’, the Rockin’ Horse album, which he was discussing re-releasing. Some months later we heard the sad news that Hal had passed away.